NES The Bugs Bunny Crazy Castle (USA) "Special Levels" in 04:15.38 by Brandon Evans. 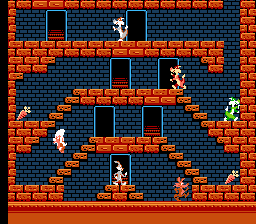 The Bugs Bunny Crazy Castle is a frustrating action puzzler. In it, you take control of Bugs as he collects carrots while avoiding enemies such as Sylvester the Cat, Daffy Duck, Yosemite Sam, and Wile E. Coyote. This game features 4 "Special Levels" which can be accessed either by the "No Carrot Signs" found in several levels or by a password. In this run, the author, Brandon, completes these difficult levels with absolutely no help from the boxing gloves and potions featured in the main game. All he has to work with is precise movement and luck manipulation, and although this, coupled with the numerous enemies, make these levels far less trivial than the main ones, the completion time is still relatively small. Much of the length of this movie is a result of the unavoidable and abnormally long tube scenes in S4 and S1. For more details, as always, please see the author's notes, and also make sure to watch the captions provided in the encodes. The author has also created a run of the main game. This run has two YouTube streams. The first contains no input display while the second one does. This was included as the luck manipulation is heavily based on input and it's hard to follow the run otherwise.